When we think of summer, we think of wonderful things like going on vacation to the beach, pools, barbecues with family and friends, and many other fun times spent outdoors. During these activities, the heat and humidity can affect the performance of your hearing aids. 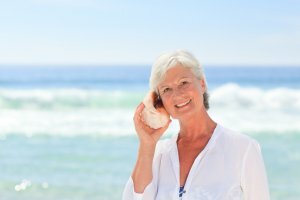 Here are a few tips that will help you take care of your hearing aids in the summer heat so that you will be hearing optimally at all your summer festivities. The moisture that comes from sweat and humidity is one of your hearing aid’s worst enemies. It’s important to protect them from moisture, even water-resistant devices. A hearing aid dehumidifier such as a Perfect Dry Lux or Dry and Store can dry out the moisture and prolong the life and performance of your device. The humidity of summer can provide ideal environments for microbial growth which can cause bacteria to grow on your hearing aids. It is extra important during these hot months to clean your hearing aids daily to remove germs and bacteria. Disinfectant towelettes that are safe for hearing aids are recommended, such as Audio Wipes. The Dry and Store hearing aid dehumidifier is also a good option because it not only removes moisture but has a UV germicidal lamp to sanitize you hearing aids. This dehumidifier is recommended for individuals who spend a lot of time outside. The high temperatures of summer can damage hearing aids if they are left in the direct sunlight or hot temperatures. You never want to leave your hearing aids in a hot car. Keep them stored in a dry, cool area when you are not wearing them. If you are spending time on the beach, you may want to leave your hearing aids inside to prevent exposure to the high heat, moisture and sand. By Dr. Christa Nelms, contributing writer and doctor of audiology at North Georgia Audiology and Hearing Aid Center in Woodstock, Ga.